dfc is a nifty little tool that provides a more human-friendly overview of file system space usage using graphs and a dash of color. This utility can be used as a drop-in replacement for the df tool. Although dfc is available only as a source code distribution, compiling the software requires only a single make command. Install then the compiled binary and the accompanying help and man files using the make install command as root, and you are good to go. 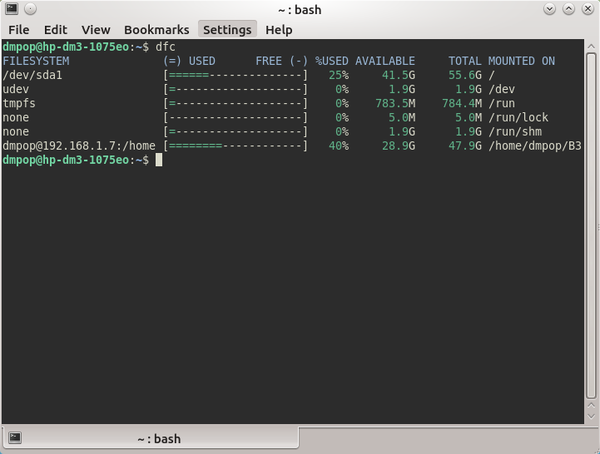 Run the dfc command in the terminal, and behold space usage displayed as pretty graphs. To view other supported parameters and their brief descriptions, use the man dfc command.